I open and close my garage door hundreds of times each year. With consistent heavy use, it’s natural to forget to close the garage. Adding a smart garage door can do more than just remind you when to close your garage door – it can also alert you every time your garage is opened or closed. Our Garageio vs Chamberlain MyQ vs GoControl Linear is a great place to start when choosing a smart garage door. We recently tested a smart garage door controller when we installed the Home8 Smart Garage Starter Kit. We loved that it came with a security camera, but it didn’t have any sensors for alerting you if you kept your garage door or if it was opened via your keypad. 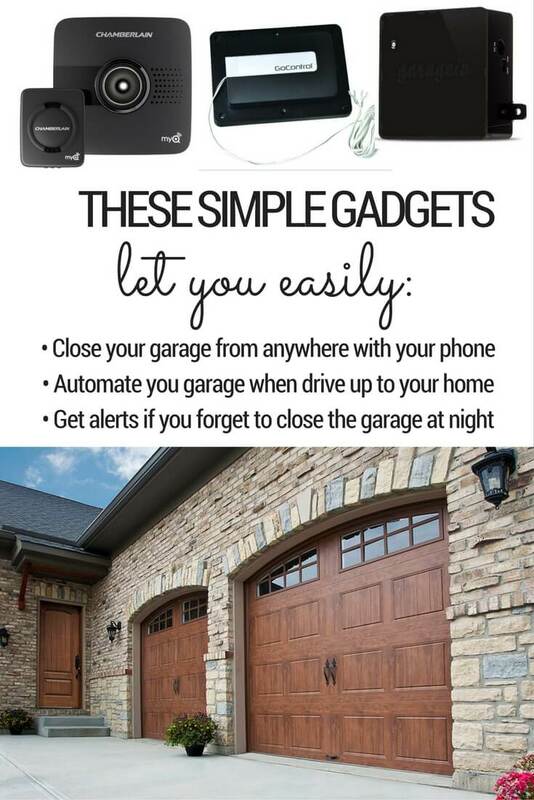 These smart garage door controllers are excellent options for getting alerts for your garage door and reminders to close it. These smart garage door controllers are all retrofit solutions. That means they work with your current garage door opener and don’t require you to replace any buttons or the actual opener that is installed on the ceiling of your garage. 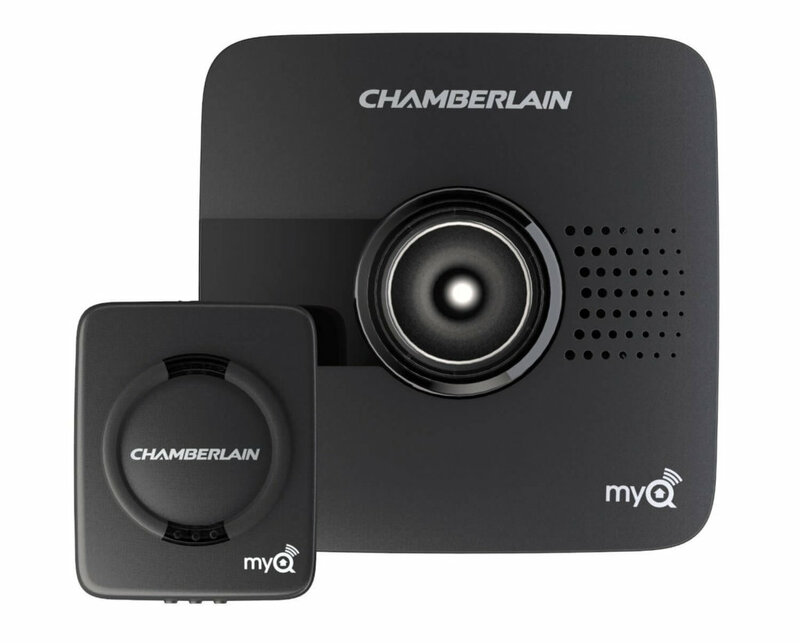 If you want a full garage door opener with smart technology, go for the Chamberlain Whisper Drive with MyQ technology. It has the smart features you need, and you end up with an entirely new garage door opening system, which is good since these systems can die and need replacing. Now, onto our Garageio vs Chamberlain MyQ vs GoControl Linear comparison. Each of these controllers work as retrofit solutions that allow you to work with your existing controllers, instead of needing to replace them. Clearly labeled wires and online directions make installation instructions clear. Garageio admits that their compatibility list of garage doors is incomplete. This can make whether or not it will work with your garage door a guessing game. Easy, wireless installation. Just install the WiFi hub near (but still a few feet away from) your garage door opener by plugging into power, then attach the door sensor to the upper, inside panel of your garage door. WiFi hub can also be installed elsewhere in the garage or home (closer to the router is a good idea), but they recommend this location due to safety. Very strong, detailed compatibility list. Connectivity can be spotty with the WiFi hub. May need to try different locations throughout the home. Works with almost every garage door openers. See the incompatible devices here; mainly, it doesn’t work with advanced or smart garage door openers. Requires connectivity to the Z-Wave network. This means you need to install a hardware controller such as the Mi Casa Verde VeraLite. Then, you need to make sure your GoControl Linear is within 130 feet of a Z-Wave Controller or Repeater. Z-Wave works by transmitting the protocol signal throughout your home from device to device, so without the system already set up, GoControl is not just a plug-and-go device. Chamberlain’s wireless set up is simple and flexible. While they recommend installing it on the ceiling close to the garage door opener, it can really be plugged in anywhere, including closer to your WiFi or still in your garage for safety and usability purposes (since it beeps and flashes whenever the door is open and shut). It’s definitely the easiest to set up and perfect for those who are just getting started with home automation. Works with IFTTT (If-This-Then-That), allowing you to create specific rules controlling your garage door and integrating it with other smart devices. Also lets you use geofencing, by automatically opening your garage when you pull up. 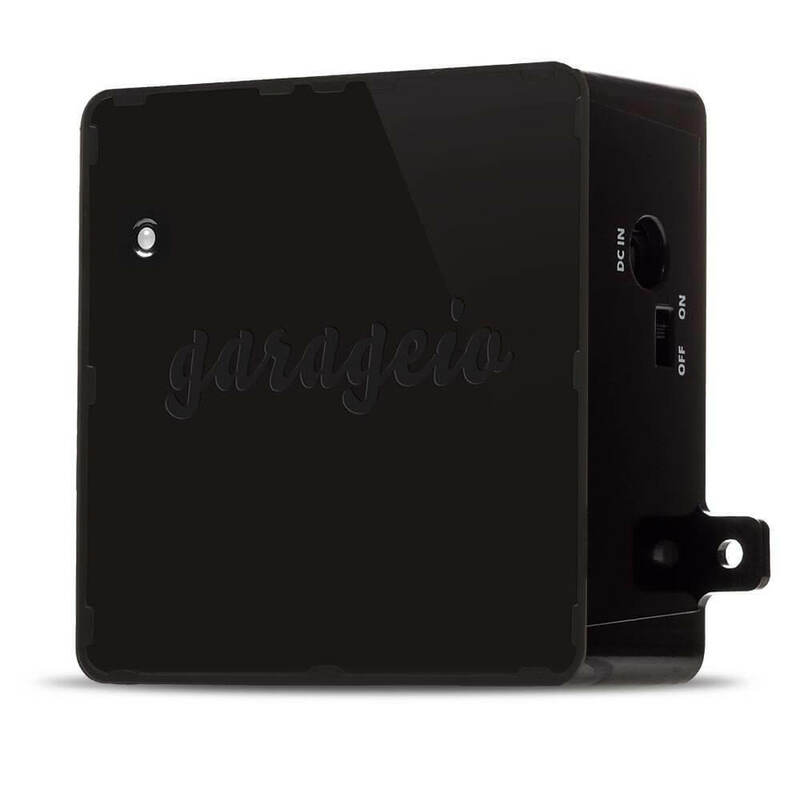 Works with Amazon Echo/Alexa, by saying “Alexa, tell Garageio to close my door” or, my favorite, “Alexa, ask Garageio if any of my doors are open.” It can also open and close specific garage doors if you have more than one system installed. Works with other smart home apps and services, including Stringify, Amazon Fire TV, and MyKnock. Their website lists compatibility coming soon to Samsung SmartThings, Josh.AI, Vinli, and Zubi Car. While Alexa integration is great, it isn’t native, which is why you have to have Alexa “tell Garageio.” It makes the commands more complicated. IFTTT integration may be dangerous. That’s why Chamberlain refuses to integrate this automated feature. No IFTTT capacity, which takes out many automation options, including geofencing. However, Tasker is one more technical system that may work for Android users. Works with Samsung SmartThings, which allows for automatically opening and closing when you leave and come home. Integrates with a huge variety of door sensors and locks, thermostats, sirens, and all other products under the Z-Wave protocol. Works with ADT and similar monitored home security systems. Many of these don’t typically provide garage door support, so it fills a gap in that area. While GoControl’s Z-Wave compatibility opens many doors for smart home products to work with, Garageio is easier to use. Using IFTTT, it’s especially easy to integrate geofencing and have your garage open when you come home, which I believe is one of the main selling features of smart garage doors. It’s also promising that Garageio has compatability with additional smart home products coming soon. That’s why for this category in our Garageio vs Chamberlain MyQ vs GoControl Linear comparison, Garageio is our winner. All devices can alert you if the garage door is left open after a certain period of time, such as 30 minutes. Alerts can be triggered 24/7, or at certain times of the day, depending on your preferences. Alerts are saved for you to review later. Alerts you when the battery in the sensor is running low; usually lasts around 3 years on average. WiFi hub includes a light that flashes and beeps loudly when the garage is closed via the app. This is a safety precaution to warn anyone in the garage that the door will be closing. Beeps and flashes for 5 seconds before opening or closing your garage door from the app, as a safety measure. While GoControl’s alerts and safety measures are both solid, Chamberlain offers the most options for customizing your alerts and storing them for future reference. It also lets you know when the sensor batteries are running low so they don’t unexpectedly go out. For alerts and storage in Garageio vs Chamberlain MyQ vs GoControl Linear, Chamberlain has to be the winner. 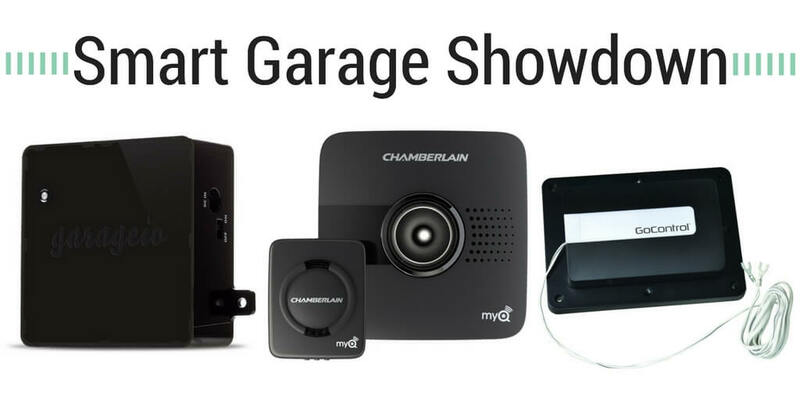 All of these devices in Garageio vs Chamberlain MyQ vs GoControl Linear work remotely, allowing you to control your garage door while you are away. They also work without requiring monthly fees. Robust, but easy to use app with advanced features like remembering your password, etc. This was an easy one for Garageio vs Chamberlain MyQ vs GoControl Linear. Chamberlain’s software and app isn’t just easy to use, it’s also filled with the features you want. It also has a web application for viewing your garage door from your desktop. Garageio is basically just an app with an open or close button, while GoControl’s completely depends on your Z-Wave environment and controller. For that reason, Chamberlain is a safe bet for a solid smart garage door. Today, this is the all-around best smart garage door controller, but especially in Garageio vs Chamberlain MyQ vs GoControl Linear. It’s smart, functional, easy, and still prioritizes safety. Its alerts and app will truly make your life easier. There’s just one huge missing feature: geofencing. Adding IFTTT like Garageio has is a good solution, or they can program their own solution if safety is a concern. Regardless, geofencing is a must-have for this sector of the smart home. I’d also like to see some Amazon Echo support, as well as clearer instructions as to where exactly the WiFi hub should be installed for optimal communication. If you find that Chamberlain MyQ isn’t compatible with your garage door or isn’t what you’re looking for, but still want similar features, make sure to check out the Liftmaster MyQ, which is built by Chamberlain and almost identical in hardware and software. That’s our full comparison of Garageio vs Chamberlain MyQ vs GoControl Linear. Which smart garage door controller is your favorite? Let me know in the comments below!